Last Night's Squall Line - Hi, friend Climate and Weather Information, in this article entitled Last Night's Squall Line, we have prepared this article well and concise to be easy to understand for you to read and can be taken inside information. hopefully the contents of the post that we write this you can understand and useful. okay, happy reading. Last night, between roughly 12:00 and 1:00 AM (depending on where you were) an intense line of thunderstorms and strong winds moved across the Washington coast and swept across western Washington. Winds gusted to 60-70 mph along the coast and to 40-50 mph in places across the interior. A significant number of trees were toppled plus innumerable loss of branches, resulting in power outages affecting thousands of people. Thousands are still without power Tuesday evening. And there was quite a bit of lightning too. There was a considerable change in virtually all weather parameters with this front. 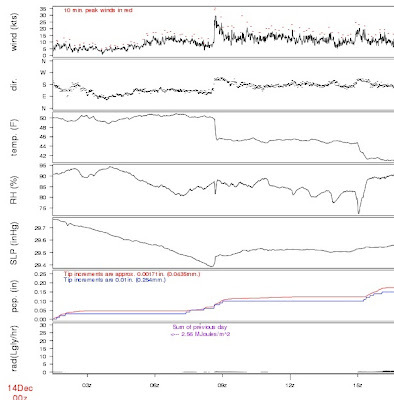 Here are the observations at the top of the atmospheric sciences building here at the UW (click to expand). 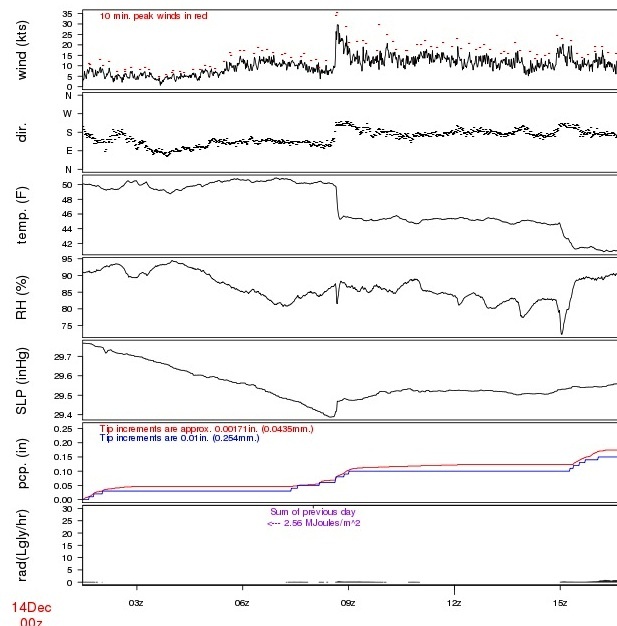 The winds gusted to 40 mph (top line), the wind direction shifted abruptly to the south, temperature plunged by 6F, pressure spiked upwards (fifth line), and lots of precipitation fell. My dog was terrified. Was this predicted? Not really. We knew a strong front with good rain was coming in, but did not foresee such an intense event. But with a coastal radar we probably would have seen it coming and been able to provide a few hours warning. The number of tree losses was undoubtedly aided by the saturated soil. Wet soil has less adhesion to roots...less holding power...making it easier to wind to do its dirty work. The weather should calm down a bit now, with the jet stream and most of the action going into California, for the next few days. AND...today there was an F2 tornado at Aumsville, 10 miles NE of Salem, Oregon. Thank You and Good article Last Night's Squall Line this time, hopefully can benefit for you all. see you in other article postings.